For more than a 100 years it has been steadily growing in popularity: The white T-shirt. Invented by the U.S. military at the turn of the century, it was idolized by James Dean in the mid-1950s as a symbol of masculinity and nonchalance. The story of an eternal fashion trend. 1904 – The "Cooper Underwear Company" publishes a newspaper ad with the announcement of an innovation: The bachelor undershirt. "No safety pins, no buttons, no thread" was its slogan. The modern T-Shirt had been invented. 1920 – The "T-Shirt" gets its name when the writer Scott Fitzgerald uses the word creation for the first time in a book. Afterwards, the word "T-Shirt" is eventually added to the Merriam-Webster-Dictionary. 1951 – In America, the white Tee becomes widely popular in the 1950s, when actor Marlon Brando is wearing it in the Hollywood movie "A Streetcar named desire". 1956 – The movie "Rebel Without a Cause" makes James Dean an American icon overnight and brings the white T-Shirt its cult status to this day. 1977 – The graphic designer Milton Glaser invents the shirt design "I love NY" that skyrockets the New York souvenier market instantly. To this day, his print is one of the most popular designs in the history of the white T-Shirt. 1980 – In the 80’s, the white T-Shirt becomes the "empty canvas" of any message for people that belong to a certain movement. The New York Times therefore gives the white T-shirt its flattering nickname: "Medium for the Message". 2010 – In 2010, the bulletproof vest becomes somewhat "James Dean-cool", when scientists invent the world’s first bulletproof white T-Shirt in 2010. 2 Billion T-Shirts are approximately sold globally every year. 6 Miles of yarn is necessary to manufacture just one single T-Shirt. 2.700 Liters of water are used to grow the cotton needed for one T-shirt. Thank you Dresden for having us at the room & style trade show. It was a great start into 2019 and the first event we’d participated so far from January 4th until January 6th. Let’s rock it together next year. Thank you all for coming. Our perfect white T-Shirt will be represented at the Selvedge Run in Berlin starting from today, July 4th until July 6th during Fashion Week. The authentic and quality-conscious Trade Show for garments and crafted goods is a must-see. Stop by at our booth when you're around. This is what our little booth looks like. How do you like it? whytes' T-Shirts can be paired with everything - and I'm saying that without hesitation. I tried this amazing Tee for a special event - it worked! For everyday outfits it is a no-brainer anyways. I total think that everybody should have on of these T-Shirts, because it is not your regular white Tee. This one will be like your second skin. Almost everybody who saw my whytes T-Shirt said it looks so well made and expensive. And let's be real: Who doesn't' want to look like a million bucks! Thank you Donovan for your very kind words. We love ya! 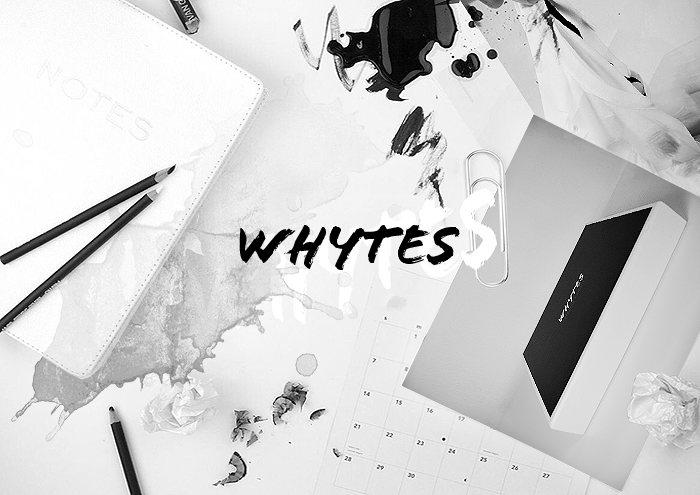 whytes with its perfect white T-Shirt was at the house of LOFT Designkaufhaus in Karlsruhe. The Premium Lifestyle Trade Show was held from Mai 19th until Sunday 21st. You guys had been awesome. As you can see below, we were sold out in almost every size! See you all again next year. We were flabbergasted when Google in Germany asked us to tell our founders story at their headquarters in Hamburg. Google's weekly all-staff meeting called "TGIF" (Thank God it's Friday) was introduced to give their employees the possibility to review news and product launches from the past week. But every other week, it's also about inviting "non-Googler's" like labels and companies from different industries to talk about their stories, different approaches in order to keep them up to date and open-minded about interesting things. Last Friday, the founders Thomas and Nadia of whytes could give a 30-minute presentation about their product, the perfect white T-Shirt on-site and answered all questions the Google employees had at the following Q&A. We were amazed by the very interested audience and had a blast at Google's 10-story building directly in downtown Hamburg. Looking forward to working with them on a lot of other different projects. Stay tuned!